The strandings began on Feb. 4 when three Common dolphins beached themselves in one day in Huntington Beach and Laguna Beach. Pacific Marine Mammal Center (PMMC) has responded to six bleached dolphins over a span of only 14 days. PMMC’s veterinarian said some reasons causing the strandings could be viral infections, bacterial infections and toxins. The center has responded to five more bleached dolphins compared to last year’s numbers. An increase of dolphin stranding in Orange County has raised concerns for Pacific Marine Mammal Center (PMMC) after responding to six bleached dolphins over a span of 14 days. The strandings began on Feb. 4 when three Common dolphins beached themselves in one day in Huntington Beach and Laguna Beach. 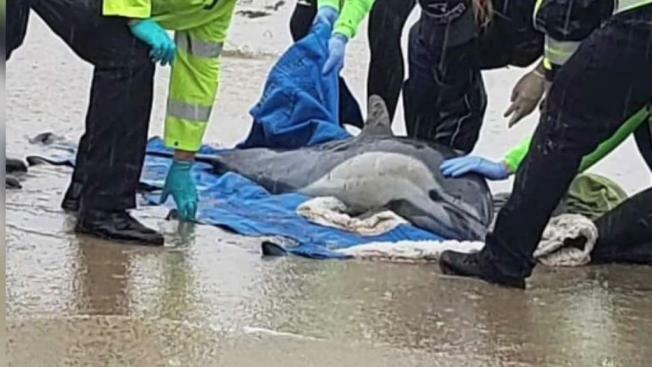 One dolphin washed up deceased, and the other two dolphins were humanely euthanized. Six days later, Corona del Mar was another beach targeted after two pregnant deceased female dolphins washed ashore. Then, Corona del Mar saw once again another stranging of a male common dolphin on Feb. 18. In response to the burst of bleached dolphins, PMMC is researching the reasons behind the strandings by partnering with scientific agencies. "With so many incidents concentrated in such a short period of time, this has taken up much of the attention as well as our resources away from our more 'traditional' animal care operations focused on seals and sea lions," Peter Chang, CEO at PMC, said. The center has responded to five more bleached dolphins compared to this last year's numbers.